A wood router is a power tool used to cut out areas on the surface of a wooden object. It is a seriously essential machine with carpenters. With an electric motor, the wood router may lead to safety risk potentially. Thus, users should know how to use a wood router fluently and what technical standards are to work with it properly. According to structure of the wood router, axis, joints and blades follow the linear motion rules. Therefore, one of them do not work, the others also do not operate smoothly. Here is some useful tips to control the wood router correctly. This is first important advices before you want to use the router for your woodworking, evenly the simplest tasks in households. You define your type of router you bought, and then read manual, safety methods and learn how to use it with skilled workers. You have to test the router, check the components of the machine before operating. In addition, you should examine the electrical power when starting to work as well as disconnect it after finishing. You also regularly clean the wood router and working place in order to avoid burning by wood shavings. There are some incidents happening with users when using the wood router improperly such as splash of material, electric shock, explosion, collision and poisoning… Therefore, you should consider technical safety of using the wood router, especially if you are an amateur in this field. To begin using the wood router, you should perform manipulation carefully and slowly. About the switch on the router, because the cutting bit rotates clockwise, hold securely the base of the router, router the piece from left to right and then the cutting bit will feed the wood. 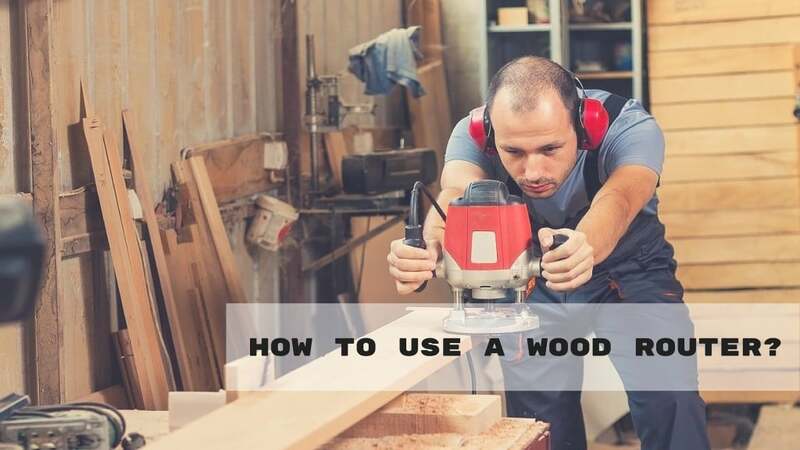 You should not move the wood from right to left following the clockwise of the cutting bit, if do that, the router run along the wood, it is very dangerous if you lose control the router. To splinter a piece of the wood as well as keep a firmer control, you should start router a series of some shallow cuts. Moreover, because of uneven pressure on the wood router, it makes unintentional gouges into the wood and the shallow cuts can compensate for that. To delete the gouges, you make a slightly deeper cut than the cuts where the gouges presented. When you are familiar with shallow cuts, you can control the wood router quicker and stronger to create the perfect cuts. Choose a good method for increase router control that will help you to use the wood router more firmly. An acceptable option is a portable router fence attached to the wood router to instruct smoothly the cutting path for the router. In addition, to advance the control of a router, you also can use router bits with attached ball bearing tips that you can adjust their sizes for various router bits operations. These are some helpful tips to easy to control the wood router better and save a lot of time in woodworking. Although the new router bits will be completely sharp and perform well, as using many times, in particular, cutting with hard woods, it can become dull, not safe and not operate properly anymore. In order to wash off them temporarily, you should often sand them with 220 grits, and then 440 grits. The router bits can be better if you sharpen them on a sand stone or look for an expert to do that. In general, read how to use a wood router can support your manipulation in fact and protect you from splintering accidents. The wood router is a helpful tool in manufacturing as well as woodworking since this is a very important stage to enhance the value of finished goods, smooth the surface of wood and easy to manipulate for other stages. These tips are still not enough for you because there are very various types of the wood router for your purposes. You should refer some other instructions to understand more about the power tool form of router and being acquainted with its operation, particularly with the amateurs.